Hi! We are Wil and Mariska, the duo behind A Variety of Fruits. Originally from South Africa, we have moved around a bit in the pursuit of fruit and to quench our thirst for adventure. In 2012 we made a big move to Mexico with our two daughters and currently, we find ourselves living, and loving it, in Valencia, Spain. 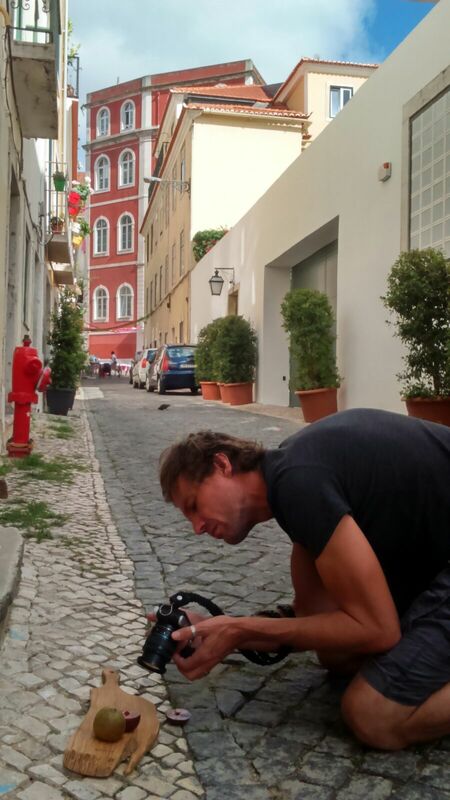 Wil photographing fruit on the streets of Lisbon. Wil is a fruit fanatic, lover of fruit, fruit evaluator, passionate fruity and all other terms one can use to describe a person obsessed with fruit. I am The Fruit Lover´s Wife with a love for wine, netball, 100% cacao chocolate, good food and cooking. A Variety of Fruits is where we talk about new and interesting fruit varieties along with whatever is happening in our life. Wil is a Horticulturist and I am a Food Scientist, which basically means we like to explore and ask questions about new fruit and food. About life. Thanks for being here. Hope you enjoy the read! Congratulation Wil and Marisca i have the oportunity to met you in Mexico and i know that you really like fruits.i met your two beautiful daughters and i think the work you are doing now is interesting and also you going to teach the beutiful is life for your daughters too. I like fruits too and i still in investigation area and i share with you the importantance that is have information about fruits that we can consume and are over the world. Thank you for your inspiring words Alma. I am glad you are enjoying our blog. It was great to meet you, hopefully fruit will take us back to Mexico someday and we can meet again :). You are doing fantastic work there!! I hope you may be able to help me identify an aromatic fruit that I discovered in Zimbabwe in the eighties. I do not know if it was indigenous as I only saw one tree. The fruit was about the size of a small plum but had if I remember correctly two or three large pips in the center. I do not recall the colour of the ripe fruit but I think the flesh part was a creamy colour. It had a wonderful aromatic taste. The tree was quite large 2-3 metres with large leaves. I hope my memory is not too far off. P.S. “The Compete South African Cookbook” has a simple Green Fig Preserve recipe that may be worth adding to your website. I have seen figs in parts of Europe but not found anything like the fig preserve in SA. From what you have described it sounds a lot like a loquat (Eriobotrya japonica). Although not indeginous, it is a popular garden tree in South Africa and we have fond memories of eating them from the trees as kids. The trees thrive in subtropical climates so it could be quite possible that they were growing in Zimbabwe. Interesting fact, this fruit is grown commercially in Spain under nets in Callosa d’en Sarrià. On the subject of the fig preserve, we do agree with you. After 4 years here, we have yet to find a fig preserve that will match the one in SA.